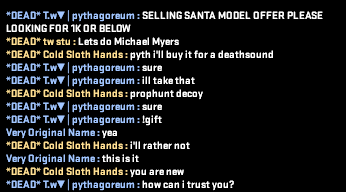 Details (Explain what happened): I've been trying to sell my CT santa model or trade it for the past week, and I found someone (Cold Sloth Hands) who was offering their TF2 spy deathsound for the CT santa model. I asked how could I trust him and he said hes been playing before and that his stats got reset. Proify said something and I felt that it was okay. 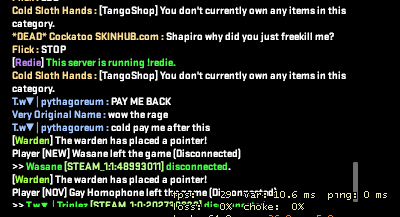 I sent the CT model to him via the !gift command and I told him I sent it. He didn't say anything and I figured he was just doing the minigame because at the time he was a terrorist. 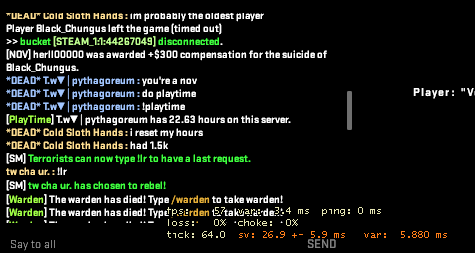 I asked him to pay me after he dies or after the round ends. He never said anything. I waited 2 whole rounds and I still have gotten nothing. I asked him pay me now or I will report it on forums, and then he started sending the message, "You currently don't own any items in this category". I told that I did send it to the right person and he didn't say anything for over 6 rounds. I waited patiently and asked multiple times to pay me; no response. Then he leaves the server approx. 15-20 min after the scam and I asked Proify what he can do. He said he couldn't do anything about it and that he would tell Alex about it. Also sorry for being toxic because in the demo I was extremely pissed over the scam. The scam starts in the 230000 tick area I believe. Haven't seen Cold Sloth Hands on JB in a while so I assume he may have just taken a break after that to not get confronted by me. Been wondering if there was a way to check my gift logs to other users. I still have not gotten a death sound for my ct model. Deathsound Was Given To Proify The Same Map I Was Trying To Anoy You A Bit But It Seems Like It Anoyed You Abit To Much. Proify Must Have Not Read My Steam Msg I Sent Him Since The SeRvEr Was Abit To Chaotic At The TimE..
Could you gift it back at least?